An example of a website claiming that historians avoid calling indentured servants ‘slaves’ for political reasons and are consumed by ‘white guilt’. The reluctance to differentiate between indentured servitude and perpetual chattel slavery in these contexts gives succour to ahistorical types, such as neo-Nazis, 9/11 Truthers and White Nationalists. Their propaganda includes a conspiracy theory claiming that historians avoid calling indentured servants ‘slaves’ for political reasons. They protest that historians are not to be trusted and that one should avoid reading ‘biased history books’ about slavery, as they have covered up the ‘truth’. Those inculcated have been persuaded to ignore contextualised history. In an op-ed piece for the Dublin-based thejournal.ie, the three authors of this article were attacked with comments claiming that our ‘white guilt’ was compelling our research agenda. Other accusations of ‘denial’ are intended to have a chilling effect on this debate by co-opting the loaded language usually reserved for Holocaust denial. 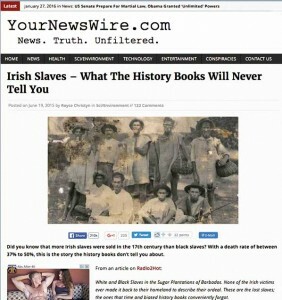 It is pertinent to point out that Michael Hoffman II (a Holocaust-denier) and the Barnes Review (a Holocaust-denial journal) endorse the ‘Irish slaves’ meme, which does not differentiate between indentured servitude and perpetual chattel slavery. Personal Histories is an initiative by History Ireland, which aims to capture the individual histories of Irish people both in Ireland and around the world. It is hoped to build an extensive database reflecting Irish lives, giving them a chance to be heard, remembered and to add their voice to the historical record. 1969 Prime Minister Terence O’Neill agreed to universal suffrage—‘one man, one vote’—in local elections in Northern Ireland. His cousin, Major James Chichester Clarke, resigned in protest the following day. 1967 Walter Mackin (50), actor, dramatist and novelist, best remembered for his historical trilogy Seek the fair land (1959), The silent people (1962) and The scorching wind (1964), died. 1970 In Northern Ireland the Alliance Party, representing Unionists, Catholic Liberals and the New Ulster Movement, was launched, under the leadership of Phelim O’Neill. 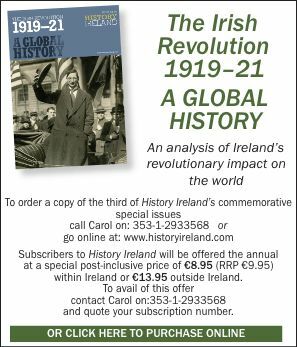 Copyright 2019 History Ireland. All rights reserved.